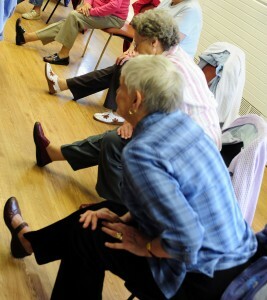 These seated exercise classes have been designed with the Activities for Daily Living (ADLs) in mind. The exercises improve balance, co-ordination, strength and flexibility in the areas of the body most need for Daily Living. Thera-bands of various suitable strengths will be provided. The Benefits of Chair Based Exercise include the following. – Improved Balance, co-ordination, strength and flexibility. – Improved range of movement. – More freedom as ADLs become easier. – Exercises that you might be able to do again at home. Before we begin we will need to carry out simple PAR-Q forms where necessary. The Chair Based Exercise training course is endorsed by CYQ, Skills Active and REPS. Click HERE for more information about the course.